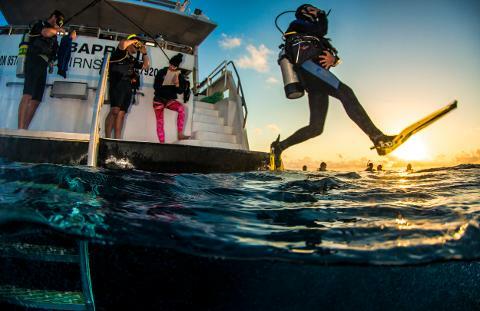 This 3 day liveaboard dive and snorkelling adventure departs from Cairns and is unmatched for experience and value and will show you the very best the Outer Great Barrier Reef has to offer. 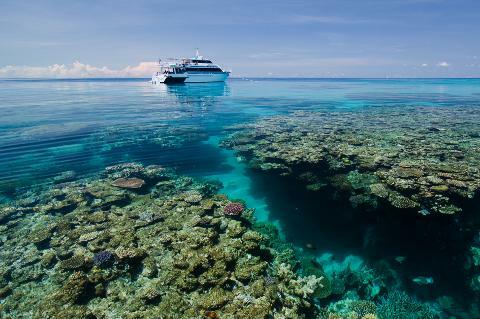 There is no doubt that the best way to really experience the Great Barrier Reef is to stay out there for a few days. 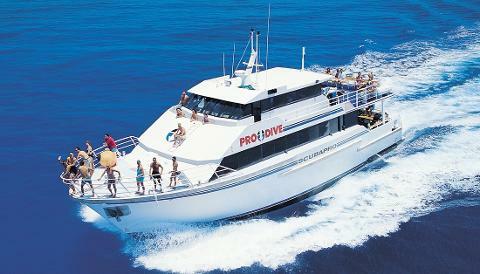 The experienced and professional crew of Prodive Cairns will look after us and make this trip and unforgettable one. We have 16 exclusive dive sites on 4 different outer reef locations and we visit a selection of these sites on every trip. These sites have been selected for their variety and quality of both coral and marine life as well as great visibility. We rarely dive the same site more than twice. Provide Cairns operates 3 premium, purpose built, multi million dollar dive vessels provide the ideal way to stay out and experience what the reef has to offer. These vessels are 25 metres (80 feet) in length and feature 14 twin share and 2 double cabins with shared amenities (8 shared bathrooms total). The vessels are centrally air-conditioned, light and airy. There are 2 large decks, one for gear and one strictly for sun tanning and relaxing. These vessels are the only purpose built outer reef liveaboards operating in the area. All dive & snorkelling equipment - includes dive computer, wetsuit and dive torch. The PADI Advanced Open Water Diver course can be conducted in conjunction with this trip. Accommodation on the night prior to departure and on day of return. We offer budget accommodation as an optional extra. If you like to arrange for your own accommodation, checkout Expedia's (link above) flight/hotel packages. They can be incredibly cheap. Select 'only need hotel for part of my trip' or ring the customer service. Complimentary hire equipment is included. To minimise travel luggage and to maximise the comfort of your own gear, maybe only hire a BCD as this takes up most of the space. 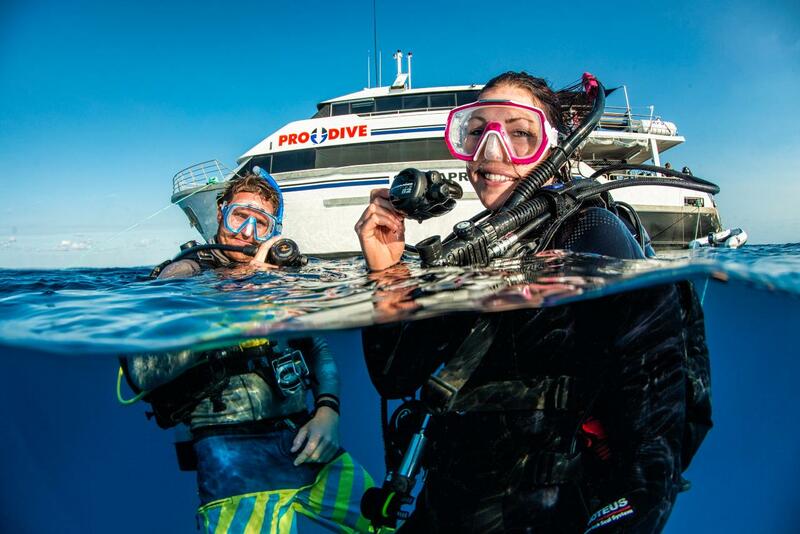 This trip is suitable for non-diving partners and friends. Bring them along and book onto as a snorkeler. If you are flying into Cairns, you need to arrive the day before departure and fly out on the day after your return (no flying after diving). Arrive at anytime of the day in Cairns. 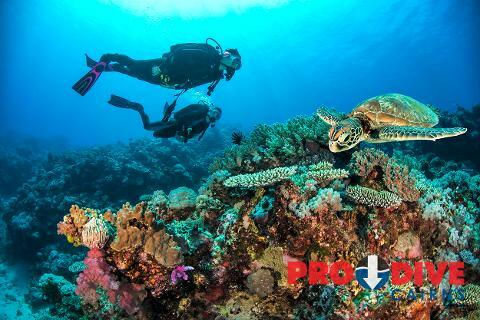 If you have time we suggest you drop into Prodive's retail shop, located on the corner of Shields & Grafton Streets, where you can arrange your dive equipment for the trip (this means you won’t have to do it at 6:00am on the morning of your trip!). As an option, you may wish to learn about the reef and fish you will meet by visiting 'Reef Teach' - a 2.5hr marine biology presentation (additional cost). Day before Departure: Lets meet up for a drink and dinner at venue TBA. Please note, the above itinerary is a guide only, and the order of sites may change. The captain will always adapt the itinerary to the prevailing weather, tides and currents. Meals may vary slightly depending on availability of seasonal fruit and vegetables. Please advise if you are a vegetarian and we will do our best to make sure we cater for you. Please make sure you read our terms and conditions prior to making this booking. Furthermore, we strongly recommend to take out travel insurance.